Laptop Thoughts: Netbooks and New Intel Atom Processors: Still Here! Netbooks and New Intel Atom Processors: Still Here! "Despite a recurring belief in the press that netbooks are dead, the lilliputian, low-power laptops are still selling in volume. Intel certainly isn’t giving up on the category. Today, the chipmaker announced its next-generation “Cedar Trail” Atom processor for netbooks, which promises even lower power consumption than current models, along with the ability to play 1080p video." 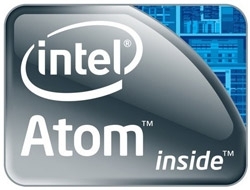 Intel's new Cedar Trail processors will be marketed as Atom N2600 and Atom N2800, using Intel's 32nm process. This should enable better power efficiency and allow thinner, lighter (and I assume faster) netbooks to be built. Intel says that this generation's battery run time should be around 10 hours. The new chipset(s) also enable playback of 1080p video, supports Intel's WiDi (wireless display) technology, and should allow one to stream content to a TV (additional hardware may be needed for this feature). Additional features support faster connectivity and startup. We should see netbooks from the usual suspects (minus Dell) in 2012. I still like this form factor, if the screen resolution is 1366x768 of greater, so it'll be interesting to see how this generation of netbooks is marketed.